Inputs: 10 - Mic x6, Stereo x2. High quality DSP effects. Garden & Patio. Air Conditioners. Can I reserve item(s) that I intend to buy later?. Power Supplies. What is the warranty period on Electromarket products?. Buy Behringer XENYX Q502USB 5-Channel USB Mixer featuring One XENYX Mic Preamp, 48V Phantom, Two Stereo Line Inputs Built-In Stereo USB Audio Interface. Review Behringer Q502USB. Microphone Input 1 x XLR, Balanced, Discrete Input Circuit XENYX Microphone Preamp with 48 V Phantom Power (Switchable). Ultra compact and lightweight design. High quality DSP effects. Garden & Patio. USB/SD card recording/playback. Air Conditioners. Czech Republic. Can I reserve item(s) that I intend to buy later?. Power Supplies. Wharfedale Pro. Portable Mixer. See photos. Soundking DM20 Digital Mixing Desk - 16 Input - 8 Output. The Soundking DM20 is a digital mixer designed for live performance mixing in the modern age. The DM20 is an ideal mixing desk for bands that mix themselves or sound technicians mixing multiple bands. Tape was to stop people fiddling - desk is working fine! Working order but well used. Monacor PA-803USB Mono PA Mixing Amplifier. Mono PA mixing amplifier, with integrated MP3 player. Equalizer bass ±10 dB/100 Hz. Equalizer midrange -. Equalizer treble ±10 dB/10 kHz. 1 x RCA L/R (aux/phono). The Mackie ProFX12v2 12-channel effects mixer provides a comprehensive live sound solution ideal for applications like band rehearsals or smaller performances. A no-compromise live sound toolkit includes a room-shaping GEQ, flexible I/O and a built-in USB interface for hassle-free recording/playback. Amplifiers & Mixer. Mixer Cases. Microphone Cables. 3-way equalizer. Speaker Cables. Adjustable headphone output. 6 stereo line inputs, 6 balanced mono microphone inputs, switchable. Microphone input 6 x XLR, bal. Numark M2 - 2 Channel Scratch Mixer - Black. M2 is the perfect mixer for any scratch DJ. Three-band EQ and gain on each channel. EQ and gain on mic channel. Inputs: two phono/line switchable (RCA), two line (RCA), mic (1/4"). The 2-channel version of this mixer, the TRM-202 MK3 from Omnitronic, was particularly popular with DJs of electronic music all over the world. With the TRM-402 4-channel rotary mixer, the popular concept is extended by 2 channels: Now nothing hinders a creative 4-deck DJ set or a flying change during a gig. Professional 3-channel DJ mixer. Talkover button for the DJ microphone channel. Sound & vision. Pre-fader listening (CUE) to the stereo input channels via adjustable headphone output. Replaceable crossfader for crossfading between input channels. 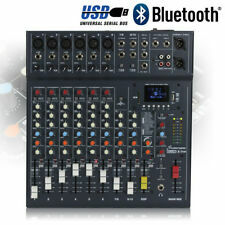 A 7-channel live stage mixer with echo effect and a USB/SD input for MP3 playback. Comes with a stereo Effect (Jack) connection for external effect processor. Suitable for bands, studio and stage applications. GAK Saving: % OFF. RRP £ 0.00. Code: 17569. All Categories.